Booking a luxury getaway in Greece is a brilliant way of getting away from it all, and I reckon you can’t go wrong by picking one of the Sporades islands as your destination. No matter what kind of holiday you’re after, Skiathos is a pretty safe bet, since it’s got a great combination of historical sites, gorgeous beaches, lively nightlife and places to relax in peace and quiet. So, what shouldn’t you miss while you’re there? 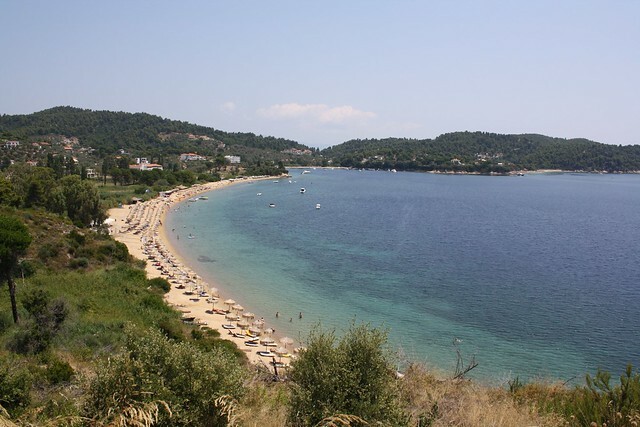 Skiathos town is the island’s capital and its central hub when it comes to things like nightlife and shopping. Since there’s so much going on here, it’s well worth stopping by, even if you’re planning a quiet break, to soak up the atmosphere and eat in some of its great restaurants. While there’s a fair amount to do, there’s one thing that really stands out. It’s home to a very scenic natural harbour, which is surrounded by little islets and always bustling with boats. This is a gorgeous sight, so make sure you don’t miss it. While Skiathos has a reputation for its nightlife and its beaches, don’t make the mistake of thinking there’s no culture here. Pretty much wherever you go, you’ll find charming, traditional tavernas that’ll give you a taste of authentic Greece, while there’s also a decent smattering of historical sites too. In fact, two of the most famous can be reached by taking scenic walks from Skiathos town – if you’re feeling lively! The first, Monastery of Evangelistria, is around an hour away on foot, but if you’ve hired a car you could easily choose to drive. It was built on the side of a mountain in the late 18th century and today is surrounded by gorgeous greenery, which adds to its striking appearance. While you’re here, it’s worth ducking inside and looking around its collection of local artefacts, which includes things like rare books and old religious icons. Another must-see is Kastro, which is a few hours’ well-signposted walk from Skiathos. This is a settlement that dates back to the 16th century, and by visiting it you can see some pretty impressive ruins, including an old defensive wall and churches. An added bonus of taking a trip here is that you also get some amazing views out to sea, thanks to the settlement’s cliff-top location. • Koukounaries Beach: This is probably the best-known beach on the island. As with most of the top tourist beaches, you’ll find this one in the south, and as well as being scenic it has a decent range of water sports facilities. • Lalaria Beach: This one is somewhat unusual in that you can only reach it by boat. If you can get there, however, you can pretty much guarantee a secluded feel and a tranquil atmosphere. • Banana Beach: If you’re planning a party-heavy trip, this’ll probably be the beach for you. It’s a favourite with young people, especially thanks to the regular parties held in its cafes and bars. • Mandraki, Agkistros and Elia beaches: These are three beaches on the west coast that are perfect for travellers trying to escape the crowds that are usually found on the southern sands. There are also some great signposted walks that give you a chance to come across pretty beaches, like the route between Aselinos and Kehria Beach. Along the way, you’ll pass Alygaries Beach and the Kounistra Monastery. © 2015 Travel Advice Europe. All Rights Reserved.